EAGAN, Minn. (AP) — Dalvin Cook’s rush through the left side of the line for 70 yards last week was the longest gain of his professional career, an early game boost for the Minnesota Vikings in an important victory over Detroit before their bye. That was the type of big running play that has been missing in most of Minnesota’s games this year, a 22.05 mph burst that was clocked by the NFL’s Next Gen Stats as the fastest in the league in 2018. That also demonstrated what the Vikings will need more of down the stretch with a daunting schedule ahead. Cook’s return from a hamstring injury that kept him out of five games was one of the most important developments of the season. 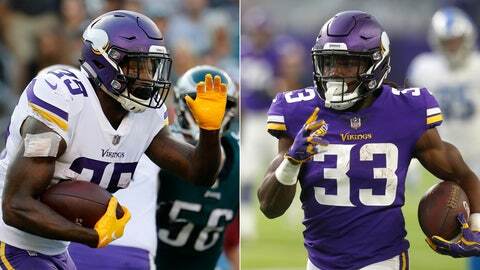 Though Latavius Murray has 439 total yards and five touchdowns over the past five games, Cook’s return will be vital toward continuing the revival of a running game that ranks 28th in the league with an average of 91.7 yards per game. The Vikings (5-3-1) play at NFC North-leading Chicago (6-3) on Sunday night in a game for control of the division. That’s one of three games over the next four for the Vikings that will be on the road and outdoors in northern cities. When Cook was healthy in the season opener against San Francisco, the Vikings had 116 rushing yards. They then went four straight games with fewer than 20 rushing attempts and 77 rushing yards or fewer, until Murray produced a 155-yard performance on 24 carries in a victory over Arizona on Oct. 14 . Cook and Murray combined for 120 rushing yards against the Lions. The Vikings have averaged 124 rushing yards over the past four games, up from 65.8 yards per game on the ground over the first five weeks. The Vikings also claimed running back Ameer Abdullah last week after he was waived by the Lions. Abdullah, a second-round draft pick in 2015, only appeared in three games this year and carried the ball once. He averaged 3.8 yards per attempt in three seasons as the primary ball carrier, when he wasn’t injured, before being replaced by rookie Kerryon Johnson this season. Abdullah will also be an option as a kickoff returner.